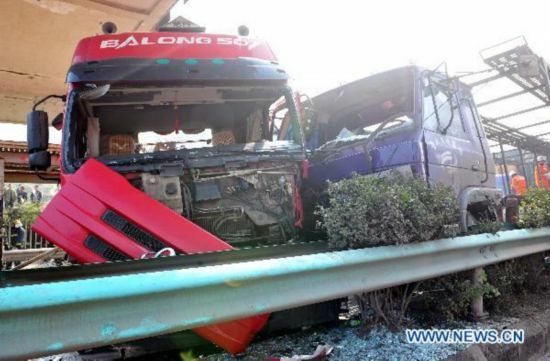 Seven people were killed and 15 others injured when over 100 vehicles crashed into the back of each other on an expressway in southwest China's Guizhou Province Monday morning, local authorities said. The pile-up began when a truck crashed into a petrol station in Zunyi County at about 8 a.m. At least 100 other vehicles then crashed into the rear of each other, according to local firefighters. Six people died at the scene. One died in hospital. The injured received treatment at the People's Hospital in Zunyi County. It was foggy when the pile-up happened. At around 10 a.m., visibility on the expressway was still less than 50 meters, according to a Xinhua reporter at the scene. Traffic banked up for about 20 kilometers after the accident.